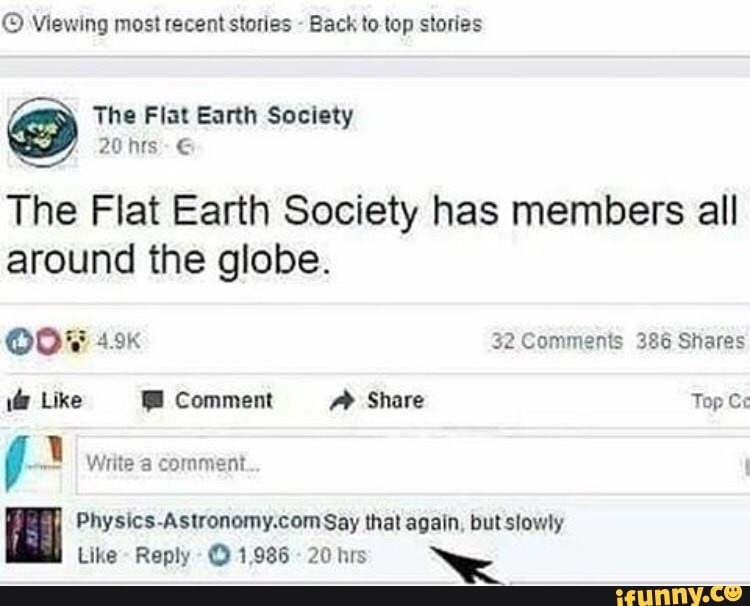 “The Flat Earth Society has members all around the globe”? I wonder if this is for real, i.e. : Did the Flat Earth Society published the post "The Flat Earth Society has members all around the globe" on social media? My doubts come from the fact that the same comment appears under different versions of the post, but with varying authors. However, there seem to be people who make fun of the society based on this Facebook post, so they seem to believe that the post is (was) actually real. I find no evidence of this being real, but I cannot prove a negative. Tineye's first record of this image appeared on May 9, 2017. When I go to The Flat Earth Society's Facebook page, this post does not appear in the first half of 2017. Neither of these things is conclusive. Tineye is a reverse image search engine. Their image recognition algorithms allow you to reverse search an image and find out when it first appeared in Tineye's records. Unfortunately I do not know how thorough their records are. It is very possible that Tineye's first record of it is actually a reposting of an earlier unrecorded image. It is possible that the post was real and the Facebook post was deleted after it became a widely ridiculed meme. The original post was not an image, and therefore would not be found by tineye. This same joke was made prior to May 2017 without attribution to an actual Flat Earth source. This shirt was originally sold in February 2017. This guy tweeted out the joke in May 2016. I sent a message to The Flat Earth facebook page asking if it was real, on 12/30/17. That was 6 days ago and they have not responded. If they do, I will edit this answer. This is a decent collection of circumstantial evidence. It all supports the idea that this image was created to be a funny meme. Not the answer you're looking for? Browse other questions tagged physics quotes social-media . Has man walked on the Moon? Is the pale blue dot Earth? Does the Eco-Cooler reduce temperatures in tin huts by around 5° Celsius, compared to simple windows? Did Saudi Grand Mufti Abdul Aziz claim the earth is flat? Has Brigitte Gabriel ever claimed that “all Muslims are radical Muslims”? Is this a real display in the United States Holocaust Museum? Did 5% of British users delete their Facebook accounts after the Cambridge Analytica scandal?